Scientists have now discovered that studying meteorites from the giant asteroid Vesta helps scientists understand the event known as the “Lunar Cataclysm,” when a repositioning of the gas giant planets destabilized a portion of the asteroid belt and triggered a solar-system-wide bombardment. Previously, researchers had only lunar samples to work with. 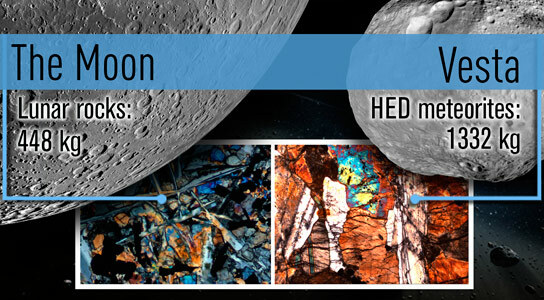 Scientists are now using a class of meteorites known as howardite, eucrite and diogenite meteorites, that are connected to Vesta to study the lunar cataclysm, providing about three times more samples to analyze. NASA and international researchers have discovered that Earth’s moon has more in common than previously thought with large asteroids roaming our solar system. Scientists from NASA’s Lunar Science Institute (NLSI), Moffett Field, California, discovered that the same population of high-speed projectiles that impacted our lunar neighbor four billion years ago, also hit the asteroid Vesta and perhaps other large asteroids. The research unveils an unexpected link between Vesta and the moon, and provides new means for studying the early bombardment history of terrestrial planets. The findings are published in the March issue of Nature Geoscience. The findings support the theory that the repositioning of gas giant planets like Jupiter and Saturn from their original orbits to their current location destabilized portions of the asteroid belt and triggered a solar system-wide bombardment of asteroids billions of years ago called the lunar cataclysm. The moon rocks brought back by Apollo astronauts have long been used to study the bombardment history of the moon. Now the ages derived from meteorite samples have been used to study the collisional history of main belt asteroids. In particular, howardite and eucrite meteorites, which are common species found on Earth, have been used to study asteroid Vesta, their parent body. With the aid of computer simulations, researchers determined that meteorites from Vesta recorded high-speed impacts which are now long gone. Researchers have linked these two datasets, and found that the same population of projectiles responsible for making craters and basins on the moon were also hitting Vesta at very high velocities, enough to leave behind a number of telltale impact-related ages. The team’s interpretation of the howardites and eucrites was augmented by recent close-in observations of Vesta’s surface by NASA’s Dawn spacecraft. In addition, the team used the latest dynamical models of early main belt evolution to discover the likely source of these high velocity impactors. The team determined that the population of projectiles that hit Vesta had orbits that also enabled some objects to strike the moon at high speeds. The NLSI is headquartered at NASA Ames Research Center, Moffett Field, California. The Dawn mission to Vesta and Ceres is managed by NASA’s Jet Propulsion Laboratory, Pasadena, California, for NASA’s Science Mission Directorate, Washington. Dawn is a project of the directorate’s Discovery Program, managed by NASA’s Marshall Space Flight Center in Huntsville, Alabama. 6 Comments on "NASA Finds an Unexpected Link Between Vesta and the Moon"
So does this correlate with the extinction of dinosaurs? Just a random musing. No, this is 60 times older than that. I have always wondered if there were more planets between Mars and Jupiter. If Jupiter and Saturn’s orbits shifted, it could have caused the shifting of two planets with their moons, placing them on collision courses that would have catastrophic consequences – the complete destruction of those planetary systems and the formation of the asteroid belt. It would explain the number of comets and other asteroids – such as the one that caused the extinction of the dinosaurs – and why there are potentially many more such bodies out there that instead of being “ejected” from the asteroid belt, were never there to begin with but were flung into their current solar orbits by the cataclysmic impact. i believe that the late heavy bombardment, which is the topic of this article, occurred approximately between 4100 million years ago and 3800 million years ago. the extinction of the dinosaurs happened 65 million years ago, therefore these two events have no connection. as for the concept of a planet orbiting where the asteroid belt now is being broken up by tidal forces from the relocating gas giants, there are merits to this idea, with a few tweaks. it is possible that one or more large asteroids were forming to the extent of protoplanets before being broken up by gravitational interactions with the gas giants. after all, the rocky planets were formed by asteroids coalescing to form larger bodies, until one body (the planet) dominated it’s orbit. there are indeed still small asteroids sharing Earth’s orbit, mostly in gravitational resonance with Earth.However, it is unlikely that a single main body (i.e. planet) ever existed in the region of the asteroid belt, since these asteroids have been prevented from coalescing by gravitational interactions with Jupiter. so they were able to match the barcode of vesta with the barcode on the moon. that’s soooo cool. so, how did they know where to look for the barcode? Isn’t it the case with most of the solar systems where exoplanets have been found that the large gas giants orbit close to the star and the smaller, rocky planets are further out? If that was the case with our own solar system early in its life, what mechanism would have caused Jupiter, Saturn, Uranus and Neptune to migrate outwards? Rogue planets? We know something big hit Uranus at some point given it’s axis is 90+ degrees to the ecliptic, and that a Mars-sized planet collided with the very early Earth (giving rise to our moon in the process). So would it be safe to assume that baby solar systems are shooting galleries and quite chaotic systems?